The need for a local 24 hour plumber usually means that you're in dire straits. We understand that and we're here to help. Of course, one person's "plumbing emergency" may be another person's "inconvenience". So, we understand it's all relative. But we also know that it's YOUR emergency and we are happy to provide our Atlanta, Ga area customers with 24 hour / 7 day a week service to fix those plumbing problems as quickly as possible. Here is a list of the most common reasons we get calls for plumbing emergencies. No Hot Water - if you have ever found yourself in the middle of a shower, head full of shampoo, body full of soap and all of a sudden - the water starts getting colder and colder and within a minute or so - you're trying to rinse off with ice cold water. Well, it will wake you up but unless you've joined the Polar Bear Club, it's just not a pleasant experience. The problem could be your water heater, could be a leak in your plumbing, it could even be an electrical problem. Either way - it can constitute an emergency. Clogged Toilets - Nobody likes to call in a plumber for a clogged toilet. Most homeowners will try to fix the problem themselves and that's good - most of the time it can be fixed with a plunger. But, there are times when that just doesn't work. And if the toilet continuously gets clogged - it's a much bigger problem. Leaky pipes, toilets, washing machine hoses and/or faucets - Dripping faucets are not only annoying but costly. You would be surprised how much more our water bill will be just because of a small leak or a running toilet. Fair Pricing and Professional Work "This is the first plumbing company with which I've had a wonderful experience. It was so easy to schedule an appointment and the plumber, Bryan, was excellent! Bryan called in advance to let me know he was on his way and arrived promptly. He was able to rule out a leak in the home that the City mentioned may be causing our high water bill. Bryan was patient and explained everything he did so I could have a better understanding of how he was able to rule out a leak. Atlantis Plumbing will definitely be our choice for all future plumbing needs - their pricing is fair and their plumber was great. I highly recommend them!" Broken Water Pipes - The Atlanta, Ga. area does get some winter - it's very mild compared to our northern neighbors but still - we do experience freezing weather a few times a year normally. That can play havoc on our water pipes as they expand and contract which can lead to pipes bursting causing minor flooding in your home and/or yard. Clogged or Backed Up Sewer Lines - A sewer line that is clogged or backed up can be a major problem. Not only do you have to ask your neighbors if you can use their bathroom (or maybe you have to run down to your local grocery store) - but the cost and time involved in fixing the problem is not instant. We recommend getting a professional plumber to fix a sewer line problem as soon as possible. Sump Pump Problems - Your sump pump is there to help protect your home. You wouldn't let your homeowners insurance lapse - don't delay getting your sump pump fixed if it's not working as it should be. Water Heater Issues - Water heaters don't come with many moving parts that would malfunction, but as we all know, anything can go wrong. The majority of water heater issues are due to age and/or poor maintenance. 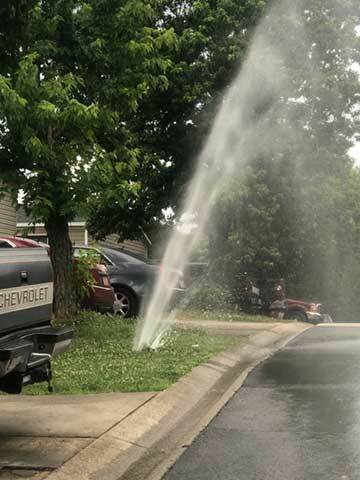 But this is certainly one of the most common reasons we get an emergency call for plumbing service. Plumbing Emergency? Contact Atlantis Plumbing now at 770-505-8570- we're available 24 hours a day, 7 days a week.